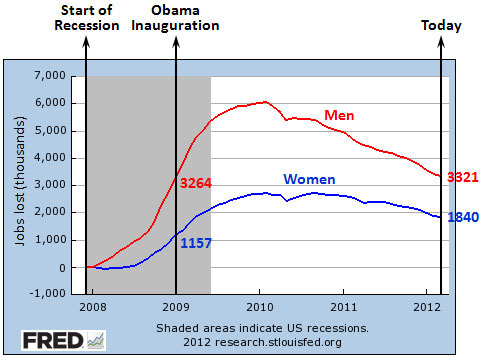 “Apparently,” sighs Matt Yglesias, “the ridiculous political attack line we’re supposed to talk about today is Mitt Romney’s claim that 92.3 percent of jobs lost since Barack Obama took office belonged to women.” You betcha! Mainly, though, this is interesting as an object lesson in how to mislead with statistics. As a political attack, it’s too lame to last more than a day or two. Pretty snazzy, eh? Men have made up ground faster than women since January 2009, so technically that means that women have sustained the bulk of the job losses since then. Very clever indeed. Politifact has more here. ALSO WORTH NOTING: It’s important for Romney to start on January 1, even though Obama wasn’t inaugurated until January 20. Why? Because if you started on February 1, you’d end up with women accounting for something like 300% of all job losses, and that’s ridiculous enough that it would give the whole game away. Even the rubes wouldn’t buy that.